The Lower Mainland, Sunshine Coast and Fraser valley have now reached the highest level of drought conditions, signaling water shortages that may impact people and industry. 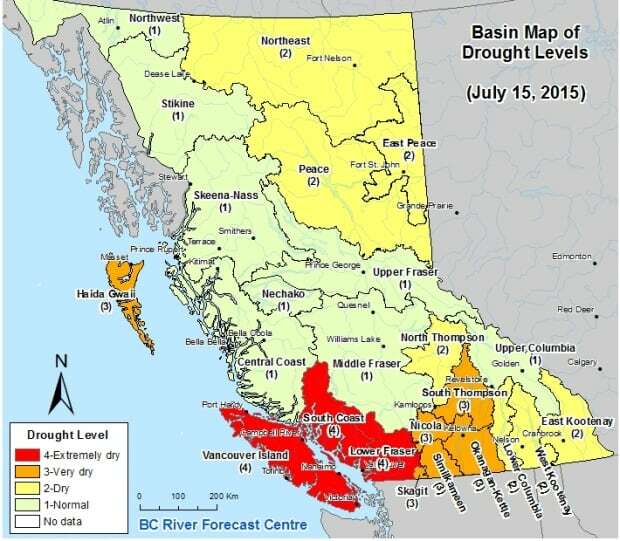 The South Coast and Fraser Valley joined Vancouver Island at Level 4 drought conditions on Wednesday, July 15th. Click for full image. (B.C. Government)Conditions are so dry in B.C's Lower Mainland, Sunshine Coast and Fraser Valley that the provincial government has raised the drought rating to the highest category — Level 4 — and are warning that if things get worse, water shortages could affect people, industry and agriculture. "All water users are urged to maximize their water conservation efforts," said the Ministry of Forests, Lands and Natural Resource Operations in a release. B.C. Forests Minister Steve Thomson said the government will be increasing education about water usage as more of the province moves to Level 4 drought. This provincial drought rating is distinct from the regional ratings used by water managers, such as Metro Vancouver — but the change means further water use restrictions could be imposed in the region, if necessary. Currently, Metro Vancouver is under Stage 2 water restrictions, which limits lawn watering and other non-essential uses of treated drinking water. The reservoir levels sit at 73 per cent, which is below normal for this time of year. 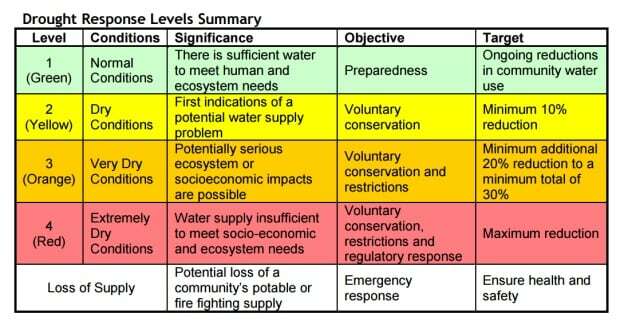 The Lower Mainland's drought rating was last raised to Level 3 on June 30, according to the release. 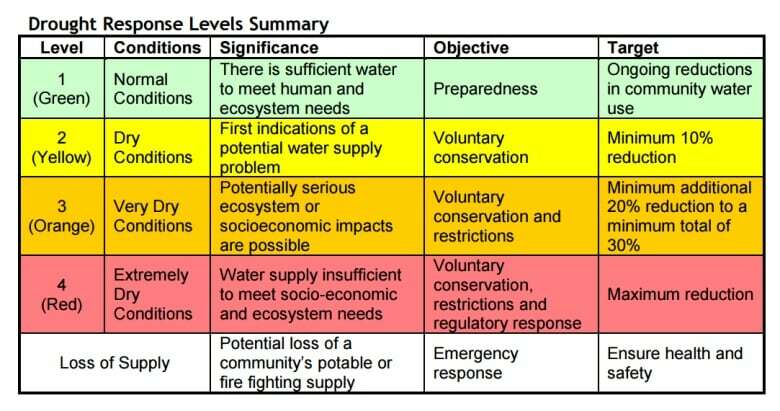 Vancouver Island is already at Level 4.